DJI has officially introduced its latest baby named Spark, which is even smaller and lighter than the foldable Mavic Pro. The company is calling it a mini drone. 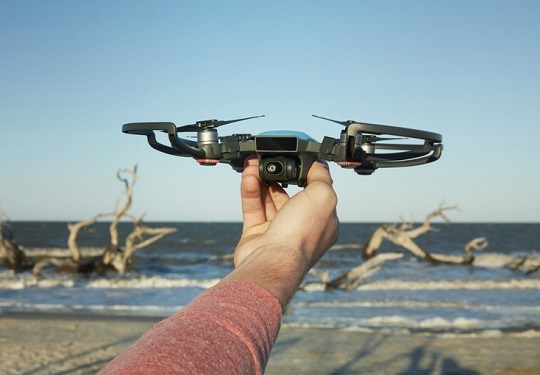 The cool thing about the Spark is that it can take off from the palm of your hand and you can use hand gestures alone to control it, so if you've never flown a drone before and you want to do so, this one is said to be perfectly built for you. When it takes off, it enters Gesture Mode. You can then send it up, away, or call it back using just your hands. Of course, you can also operate it using a remote control or mobile device. This mini drone is definitely small. It only weighs 300 grams or 10.6 ounces with dimensions of 143mm x 143mm x 55mm. Despite its small physique, though, it comes with a 1/2.3" CMOS sensor that can capture 12-megapixel photos and shoots 1080p videos. Also, it uses 2-axis mechanical gimbal and UltraSmooth technology that can dramatically reduce shake and rolling shutter effect. Moreover, the Spark can fly at a speed of up to 31mph or 50kph. It features the previously introduced Intelligent Flight Modes such as TapFly and ActiveTrack as well as DJI's latest TapFly sub-mode called Coordinate that allows the mini drone to fly to a location you tap on the screen of your mobile device. And, it is in Sport Mode by default, which sets the gimbal to first-person view (FPV) so the camera moves with you as it flies. The DJI Spark is now available for pre-order in the US at store.dji.com with an SRP that starts at USD499 or about Php25K. Shipping will begin in mid-June. Color options include Alpine White, Sky Blue, Meadow Green, Lava Red, and Sunrise Yellow.